The Canada Atlantic Railway (CAR) was a small regional railway, created in 1880 by lumber baron, John Rodolphus Booth. Initially planned as part of the transportation network for his vast lumber holdings, the railway quickly grew into a general-purpose railway serving passengers and communities along the route. Booth, a man of humble origins, was an innovative and visionary business leader. 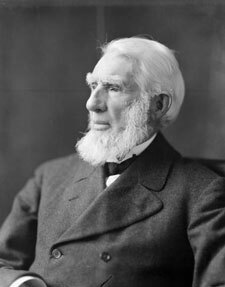 By 1879, he owned one of the largest lumber conglomerates on the continent. The hallmark of his success was his ability to transport goods efficiently and inexpensively. Rail offered the potential for him to extend his reach much further. Booth, along with two partners William Perley, and G.C. Nobel, began with the purchase and merger of two regional railway charters, the Montreal and City of Ottawa Junction Railway Co. and the Coteau and Province Line Railway and Bridge Company. Construction on the first section began in 1880. By 1882, trains were steaming into Ottawa. A car ferry and section to Lacolle, Quebec, followed in 1884. Unlike most fledgling railways, the CAR was financially successful from the start. Booth and his partners covered most of the costs of construction. Booth abhorred borrowing and consequently the railway carried very little floating debt. Booth also had a ready-made customer in the form of his own lumber empire. Booth's first target was to gain access to Vermont in order to connect with the Central Vermont Railway (CV) and further exploit the US markets. Progress on that section was slow due in part to construction of a much-needed bridge across the St. Lawrence River to replace the car ferry. Construction began in 1889 and was completed in 1890. In 1897 Booth incorporated the Vermont and Province Line Railway to build a spur to the CV. With that, the New England section was complete. While construction on the Vermont link was underway, Booth's interests began to expand into grain shipping. He cast his eyes westward towards the Great Lakes and the Georgian Bay with a plan to use a combination of rail and lake steamers to transport freight through Lake Huron directly to Duluth. This would give him the advantage of having the shortest route to the Atlantic. He focused his sights on the native-owned Parry Island, about 10 km from Parry Sound, which has one of the best natural harbours on the Great Lakes. In 1888 Booth incorporated the Ottawa, Arnprior and Renfrew Railway Company to build the first 55 miles (88 km) westward from Ottawa. Six weeks later, the Ottawa and Parry Sound Railway began construction on 157 miles (252 km) of track through Booth's vast timber limits between Renfrew and Scotia. Despite vigorous protests from the Canadian Pacific Railway (CPR), strong local support from the communities along the route won out. 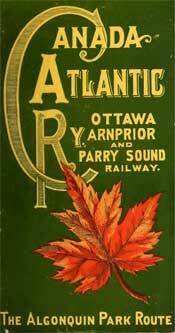 In 1891 Booth amalgamated both railways under the name of the Ottawa, Arnprior and Parry Sound Railway Company. In 1896 he took over the Parry Sound Colonization Railway, a 48-mile (77 km) long railway that was bogged down less than three miles to completion. Booth completed construction of the remaining 2.96 miles (4.7 km) to Parry Island where he established a town called Depot Harbour. It was here where he constructed a complete shipping facility, grain elevators and a roundhouse. The village also included homes for several hundred residents, a hotel, school, churches and other amenities. In addition to the main line, Booth added three feeder lines, two of which serviced his mills in Hawkesbury and Rockland. Operating under the Central Counties Railway the first line, running from Glen Robertson north to Hawkesbury, was opened in 1892. The second, running from Limoges to Rockland, was completed in 1895. A third branch, the Pembroke Southern Railway, which connected the community of Pembroke to the CAR began operating in 1899. Booth then amalgamated all his railways under the Canada Atlantic Railway Company. With the opening of the branch lines, the CPR came to the realization that the CAR had grown far beyond a lumberman's toy. To counteract the CAR's growing importance, the CPR decided it was time to teach the newcomer a lesson in the form of an aggressive price war. Throughout 1899 the two engaged in a battle that saw rates drop to practically nothing. The CAR's strong financial position, along with community support, was likely key in helping it weather the storm. By the end of the year, the CPR, tail between its legs, put an end to the games and skulked off. At its height, the CAR ran from Depot Harbour on the Georgian Bay east through the province of Quebec and into the state of Vermont. The railway covered a total of 447 miles (719 km) and earned a steady and lucrative profit. At that point Booth decided to call it quits. Following the announcement of the new transcontinental railway project in 1903, he let it be known that the CAR was up for sale. Booth's motives for selling the CAR remain murky. Given his astute business sense, it's possible he foresaw a disaster in the making and decided to bail out when the going was good. Booth was also experiencing serious business losses following a series of devastating fires at his mills. At the same time the CAR was in need of serious rehabilitation and new equipment. Booth may have decided it simply wasn't worth the cost. There were further suggestions that the government leaned on Booth to help facilitate the sale. Whatever happened, the railway was picked up by the Grand Trunk Railway (GTR) in 1904 at a cost of £2,880,000 (roughly $14 million). It took 10 years for parliament to ratify the purchase, during which time the GTR leased and operated the CAR. Much of the CAR's success was the result of back and forth loyalty between Booth and the communities served by the railway. The GTR did not inspire that type of support. Business and traffic languished and cost the GTR $4.3 million over the first 10 years. By 1914, when the GTR finally took over ownership, the company had very little to celebrate. The transcontinental railway project had turned into a horror show leaving the railway in serious financial trouble. In 1918 the government took over the Canadian Northern Railway, also in serious financial difficulty. The GTR's turn was next. In 1923 it was nationalized and became part of the Canadian National Railway (CN). As a government agency, CN was under extreme pressure to streamline operations and reduce costs as quickly as possible. Duplicate lines and services, which included the rail facilities in Depot Harbour, were among the first to get the axe. From the 1930s onward, the line was gradually abandoned in bits and pieces. Nonetheless so strong was Booth's influence that as late as the 1930s the line was referred to by local residents as the Booth Railway. Today very little is left of the CAR. Only a few small portions running from east of Ottawa into Quebec still remain in use by CN.